1. 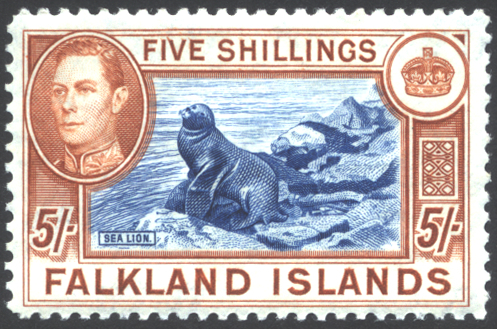 Paper and Gum - the paper and gum of the Falklands Islands stamps falls into 4 easily recognizable traits. Unfortunately, when I try to scan the backs I am unable to show you the detail that is needed, so you are going to have to come up with your own samples so that you can see the differences in the paper and gum. 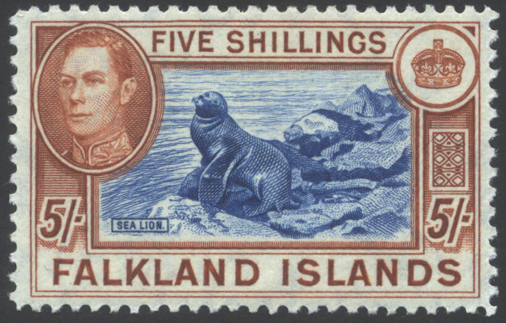 See the complete Falklands Islands article for a more complete explanation. All references to color in the statements below are as seen from the back of the stamp against black paper. 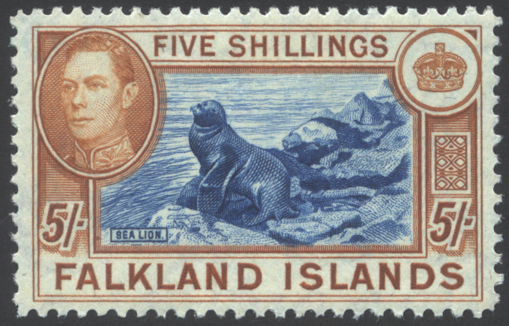 1937 Printing - Find the 2-1/2d Flock of Sheep issue. 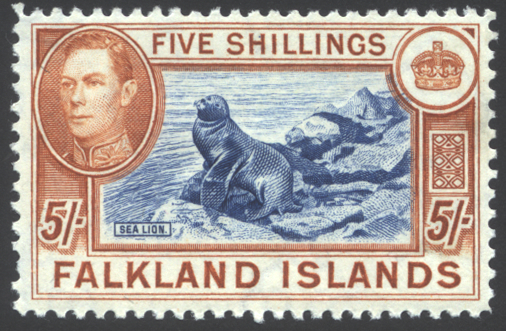 This stamp was printed only once, in 1937. Notice that the gum has visible cracks in the gum. The color tends to be more yellowish-white when compared to laser printer paper. 1938 Printing - I use the 2d Black and Violet issues for this purpose. Unfortunately, there were two printings. The deeper more pronounced color should be the 1937 printing, the duller shade is the 1938 printing. Flip the stamp over, and look at the gum. Is it cracked? If so, you have probably found the 1937 issue. The 1938 issue has a more wrinkled look to the gum (not the paper) that runs vertically up the stamp you might also see some cracked gum. This effect reminds me of a stretched cotton shirt just before it is ironed. For the record, the gum and paper will look yellowish compared to the white laser paper, but are not as yellowish as the 1937 printing. 1944 Printing - The 1944 issues differ significantly from the earlier issues we described. If you are lucky enough to find a 9d issue on tinted paper, the comparison will be fairly easy. Looking at the back of the stamp, you should notice that the gum is flat compared to the earlier issues. Where you noted cracks and a wavy appearance to the gum for the 1937 and 1938 printings; the 1944 printings have little or no texture at all. Compare the back of the stamp against a piece of white laser paper. You should note that the color is off-white, not as yellowish as the 1937 printing. If you are unable to find a tinted paper 9d issue, you should still try to compare your stamps to find this printing. This is the most common printing of the 5/ values of the set, so if you are unsure about a printing, it is probably this one. 1950 Printing - The most obvious trait is the thinner, white paper which can be easily seen against black paper. I use the 6d black for comparison. Although there are some differences, these issues are closer to the 6d black than any other printing. When compared to the 1944 printing, the white color will be clearly visible compared to the off-white color of the 1944 issues. The thinner composition to the paper can be seen when compared against black paper especially when viewed next to a 1937 or 1938 printing which appear thicker. 2. Color - the colors in this issue tend to be close to each other. I do not think you can accurately identify this stamp just by looking at color. If you are lucky enough to have found all four printings and compare them to each other, you might notice that the 1937 printing is a brighter blue, the 1938 printing is a deeper blue, the 1944 printing is more yellowish brown, and the 1950 printing might look a little brighter due to the paper color. The dates and color descriptions are per "The King George VI Commonwealth Catalogue " published by Murray Payne Ltd. The catalog numbers are from the 2008 versions of the Commonwealth (CW) Catalogue, and the Stanley Gibbons (SG) Catalogue. Please be aware that the older catalogues do not list all the printings. Look for the crackly, yellowish gum. Look for the wrinkled looking gum and deeper center color. Look for the off-white, flatter appearing gum and yellowish-brown frame color. Look for the thinner white paper. This is easily seen against black paper.